Bantu Burroughs goes for the basket. Picture Michael Gillen. 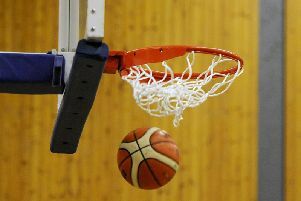 In a game of many storylines, the keys happened in the third quarter as Fury – 10 down and looking as though they were heading to defeat, came from a timeout to go on an eight point run. 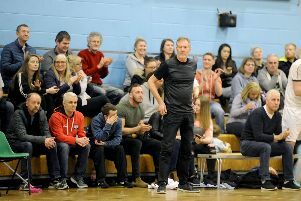 The packed crowd at the Grangemouth Sports Centre were on their feet as Fury then stormed into the lead at the start of the fourth and stayed in front in spectacular fashion to the finish, for a crucial nine-point win overturning their four-point loss to the Kings in the capital earlier in the season. Victory, and the margin, gives Fury the head to head over the Edinburgh side. Fury’s turnaround was not only on the back of the switch to a 2-3 zone defence, that saw the Kings struggle to unlock Fury’s switching D but the execution at this point from Scots Ross Gibson, Bryan Munnoch and captain Keith Bunyan. The game had started as was expected very close but unexpectedly high scoring. The first match this season had seen a 55-51 win to the Kings but by half-time the teams sat on 44-42 to the capital side. Austrian Adam Hammerscmidt had been Fury’s top scorer in that first half with 14 of his total 15points for the game. Burroughs with nine and Matrakov with eight had also performed well for Fury in these quarters. But the third was where Fury looked as though they may find themselves with too much to do as they failed to contain the Kings offence until their switch of D altered the game. The win keeps Fury at the top of the table but still on four losses which – with Dunfermline Reign needing to lose five of their last eight games – seems unlikely to remain much longer. What the Kings win does do is give the Falkirk side a great chance to take the runners –up slot and the focus for the team will be to keep winning in the run up to the Cup Final against St.Mirren and beyond. For Fury, Boris Matrakov’s 25 points was big, with Hammerschmidt’s key 14 in the first half also vital. Bunyan (trio of threes) and Burroughs shared 22pts. Ross Gibson had his best game of the season with 13 and Bryan Munnoch also had his best game with seven, particularly in that final quarter. Eddy Leginus was steady throughout while not hitting his usual big number of points. Ivan Ganchev, like Leginus contributed throughout as head coach John Bunyan restricted his rotation to eight players. This Saturday at 3.30pm at the Stevenson Building SC – the Men continue their Championship campaign with a match on the road against Glasgow University.